A direct descendent of the man who founded Ansonia wished to make a benefaction to the town. Caroline Phelps Stokes, granddaughter of Anson Greene Phelps, purchased a triangular site at the corner of South Cliff Street and Cottage Avenue. In 1891, she traveled from New York to supervise the construction of a building designed for her by architect George Keller. 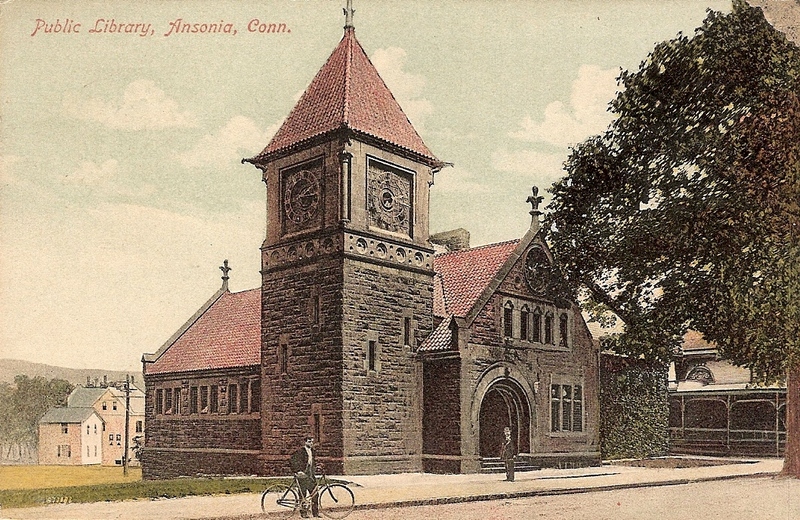 The Ansonia Library was an L-shaped structure of 70 by 82 feet, built with walls of Longmeadow freestone and a roof of unglazed red Spanish tiles. The foundation walls were constructed using wall stone from the Ansonia granite quarries. A square tower with a pyramidal roof was located at one corner of the building next to a large rounded, arched entrance. There is also a long row of high windows, grouped in threes. Minerva, the goddess of wisdom and knowledge, rests in the gable end of the roof above the entrance, ensconced in the usual foil with two lions at her feet. Heavy oak doors lead to the interior entrance hall with a stone mosaic floor with the representations of Pegasus and Bellerophon. Inside, the Reference Room boasts natural quartered oak, a large fireplace with a chimney piece of rubbed red Lake Superior freestone, ribbed barrel vault ceilings and two tiers of leaded glass windows using some colored glass. The structure – a library – was dedicated on June 9, 1892. But it sat vacant for four years because the town fathers refused to provide the $1,500 per year toward the library’s operating expenses. Finally, on August 13, 1896, the town administrators relented and voted the annual $1,500 appropriation. The library opened its doors under the charge of Annie Hadley. The Ansonia Library began with a collection of 1515 books. An addition was added to the Ansonia Library in 1960.